Amazon has confirmed their availability to brief Fairlington on HQ2 on Monday, April 29, at 7 pm, at the Fairlington Community Center, 3308 S. Stafford St. 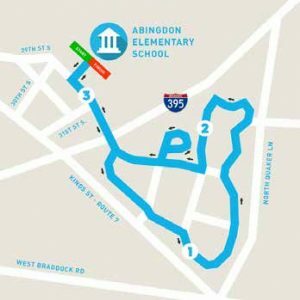 The Fairlington 5K is looking for volunteers to work the race course along key intersections to ensure runner safety. Help support Arlington County Police and the event organizers by volunteering Saturday morning and cheer on the runners! Please contact Fairlington5K at gmail.com if you are interested. Registration for the Fairlington 5K is now open! The race is Saturday, April 27, starting at 8 am at Abingdon Elementary. Register for the race here. This non-competitive, family friendly event is hosted by Abingdon Elementary School and the FCA. Roads and some parking lot entrances will be closed on a rolling basis prior to and during the race. Make plans now if you need to get out between 8 and about 9:30 am the day of the race. See route at left. Saturday, May 4: Fairlington Villages Spring Yard Sale, Fairlington Park re-opening ceremony, Family Movie Night (Moana) – more details soon! Sunday, May 5: Farmers Market season opening! Read the April 2019 All Fairlington Bulletin. Read the full GAO Helicopter Noise Study Request Letter, signed in January 2019 by Congress members Don Beyer, Eleanor Holmes Norton, and others. What is the Fairlington Citizens Association? The Fairlington Citizens Association (FCA) is about you. All residents are members and an executive board is elected annually. The FCA’s mission is to promote activities that make Fairlington a better community in which to live by serving as a forum for discussion of residents’ concerns and by representing Fairlington’s views to local government. Read more under About the FCA and find out how you can get involved. Fairlington is a National Register and Virginia Landmark Historic District.